When it comes to executing strategy, the old saying “the devil is in the details” holds true for many companies, according to Wharton emeritus management professor Lawrence G. Hrebiniak. While executives may readily participate in the development of new strategies, execution tends to get short shrift, because it is often viewed as a lower-level task or concern, he notes. In the following interview, Hrebiniak — who just published the second edition of his book, Making Strategy Work: Leading Effective Execution and Change — explains why it’s critical for firms to create a “culture of execution” in order to succeed. Lawrence G. Hrebiniak: Strategy execution takes longer, involves more people, demands the consideration and integration of many key variables or activities, and requires an effective feedback or control system to keep a needed focus on the process of execution over time. The strategic planning stage is usually more concentrated and of shorter duration than the execution stage. It often deals with interesting conceptual issues that appeal to many managers. The longer execution time horizon results in developments and changes that must be addressed over time — for example, manager turnover, competitors’ reactions to a company’s strategy, changing economic and competitive conditions, a changing industry structure and forces, etc. — suggesting the importance and difficulty of organizational adaptation during the execution process. Keeping managers and functional specialists involved in and committed to the execution requirements over a long time period can be difficult. Some managers simply give up or turn to other developing problems and opportunities, reducing the energy expended on implementation plans and activities. To some managers, execution-related issues aren’t as exciting or conceptual, resulting in less than enthusiastic attention or energy being focused on these activities. These factors, among others, increase the difficulty of strategy execution and cause managers to avoid critical implementation requirements. The key here is management support — from the top down — to create a culture of execution and maintain a focus on execution and its benefits. Hrebiniak: There are a number of mistakes I’ve observed over the years. 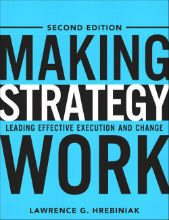 One is that strategy execution or implementation is viewed as a lower-level task or concern. Top managers with this view believe that making strategy work — the decisions and activities associated with this task — is somehow “below them,” literally and figuratively. This often creates a “caste” or class system in which upper management feels that it’s done the hard work — strategic planning — and that the lower-level people then can do the easier work of execution. This is a huge mistake, one that can create cultural rifts and poor communication across organizational levels, leading to ineffective performance and other serious problems. Another mistake managers make is to assume that execution is a quick, one-shot decision or action, like “Ready-Aim-Execute” — or even worse, “Ready-Execute-Aim.” Implementation or execution simply isn’t a one-shot deal. Strategy execution is a process, with important relationships among key variables, decisions and actions, not a quick fix marked by simple clichés, such as: “Give him the ball and let him run with it.” Failure to see and appreciate the interdependence or interaction among key factors — strategy, structure, incentives, controls, coordination, culture, change, etc. — is a costly mistake that detracts from strategy execution success. The complexity of the implementation process also results in managers ignoring the execution process, an issue I mentioned earlier. Knowledge@Wharton: What new kinds of problems have emerged since you published the first edition of your book — that is, what kinds of new challenges are managers facing when it comes to executing strategy in today’s business environment?